The PGDPM-X will be conducted on quarterly contact hour basis. The two years’ programme is divided into eight modules of seven days each. One module will be conducted every quarter. Classes will be held from Monday to Sunday once in a quarter. Module-I to Module-III will be dealing with general aspects of Management and Module-IV to Module-VI will be sector specific modules focusing on Oil & Gas / Energy / Allied Sector Management. Modules-VII & VIII will offer elective courses. The programme offerings pertain to General Management, Economics, Supply Chain in Oil & Gas/Energy Sector Management, International Geo-Political affairs, Project Management, Oil & Gas Accounting, Finance, International Maritime Affairs, Oil & Gas Information Systems, Natural Gas Distribution, Marketing of Petroleum, Oil & Lubricants, Market Structures & Game Theory and Oil & Gas Law – to mention a few. Diploma in General Management. The curriculum is designed to meet the requirement of various sectors of industry. The PGDGM-X will be conducted on quarterly contact hour basis. The two years’ programme is divided into eight class-contact modules of seven days each. One module will be conducted every quarter. Classes will be held from Monday to Sunday once in a quarter. Candidates are expected to complete the assignments, go through readings and consult the prescribed books/material when they are away from campus. The programme offerings pertain to General Management, Economics, Supply Chain Management, Business Communication Project Management, Accounting, Finance, Operations Research, Information Systems, Marketing/ Finance/Operations/Human Resources Management, Corporate Governance and Legal Aspects of Business to mention a few. The SPM Admission Committee shall be responsible for conducting the admission procedure for the 11th and 1st batch for PGDPM-X and PGDGM-X respectively. The duration of batches is 2018-2020. Total number of seats available for admission: 30 in each programme. Post Graduation Diploma in Petroleum Management - Executive (PGDPM-X) and Post Graduation Diploma in General Management - Executive (PGGPM-X) are both two year Programmes at School of Petroleum Management, Pandit Deendayal Petroleum University, Gandhinagar leading to a Postgraduate Diploma in Petroleum Management- Executive and Postgraduate Diploma in General Management- Executive respectively. Both the programmes are delivered separately on quarterly contact week basis. The two-year programmes are divided into eight modules of eight days each. For both the programmes one module is conducted every quarter. While candidates can certainly apply in individual capacity, companies are also encouraged to sponsor their employees for the programmes. Classes are held from Sunday to Sunday once in every quarter. Module - I to Module – III cover general management subjects and Module –IV to Module –VI are sector specific modules focusing on Oil & Gas /Energy/Allied Sector Management. The programme offerings pertain to General management, Energy Economics, Supply Chain, International Geo-Political affairs, Project Management, Oil & Gas Accounting, Finance, Maritime Affairs, Information Systems, City Gas Distribution and Law – to mention a few. Modules –VII & VIII offer elective courses. Classes are held from Sunday to Sunday once in every quarter. 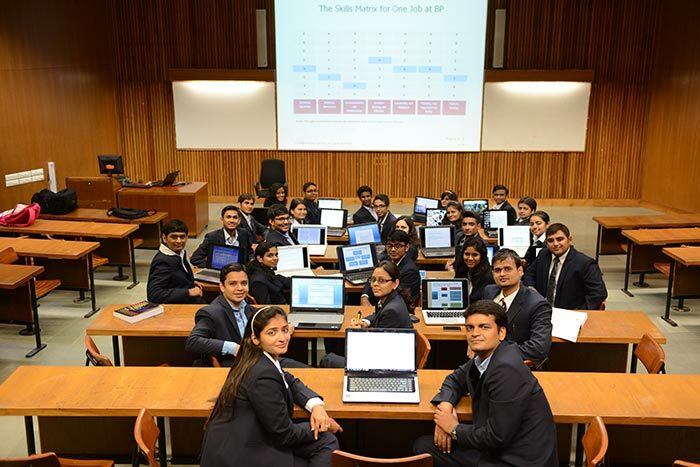 All courses over Module I-VIII have been identified and spread in such a way that they provide contemporary learning in Business and Management from an applied perspective. The course curriculum, respective courses and assessment mechanism have been designed to provide maximum learning and application to the busy executives. The programme offerings pertain to General Management, Economics, Supply Chain Management, Business Communication, Project Management, Accounting, Finance, Operations Research, Information Systems, Marketing/ Finance/ Operations/ Human Resources Management, Corporate Governance and Legal Aspects of Business-to mention a few. The Bachelor’s degree or equivalent qualification obtained by the candidate must entail a minimum of three years of education after completing higher secondary schooling (10+2) or equivalent. Degree obtained after Post SSC Diploma shall also be considered. The short listed candidates will be called for Personal Interview at SPM on specified dates. During the personal interview a panel will evaluate candidate’s understanding about business issues, analytical skills, communication skills and potential to lead. Application rating evaluates candidates on the basis of academic records of 10th, 12th, as applicable Graduation and Postgraduate, if any, educational performance. Work experience evaluates candidates on the basis of length and relevance of business experience. Personal interview: The personal interview shall be aimed at assessing the aptitude, preparedness and motivation of a candidate to pursue the PGDPM-X / PGDGM-X programme. The SPM follows rolling admission process for admission into the PGDPM-X/PGDGM-X programme. The rolling admission means the applications are processed as and when received and benchmarked against the absolute standard for making the admission decision. Therefore, the admission would stop when the batch size is met, and subsequent applications are considered only for the next batch. Availability of Admission Forms on www.spm.pdpu.ac.in from 1st November, 2017. The candidates are required to obtain the prescribed admission form as per the detailed instructions given on the School website www.spm.pdpu.ac.in by paying / sending a demand draft of Rs. 2,000/- drawn in favour of Pandit Deendayal Petroleum University payable at Ahmedabad. Alternatively the candidate may remit Rs. 2,000/- at the School’s Account at Oriental Bank of Commerce (OBC) A/C No. 09331131003242 (current account) IFSC code : ORBC0100933 and then enclose payment receipt along with filled application form. The candidates shall send application form, duly filled in, by registered post, or through DTDC/ Other reputed courier service. The University has tie-up with DTDC courier and mails sent through DTDC are delivered at the campus on daily basis. The candidates are advised to apply earliest for being considered for the 2018 admission. The applications received after 15th June 2018 can only be considered for 2019 admission. The applications received before 15th June 2017 will be considered for 2018 admission only if the batch size is not full by the time of receiving the application. Based on the review of application packet a candidate may or may not be invited for the Personal Interview (PI). For the shortlisted candidates, mutually convenient dates on a rolling basis shall be determined from 31st January 2018 onwards. All expenses for attending PI shall be borne by the candidates. The candidate appearing for PI shall report at least one hour in advance as per the schedule and register with Admission Office. The candidate reaching late on the same day is required to report to the Admission Office. An attempt will be made to accommodate the candidate on the same day if possible. Before appearing at PI, verification of all the documents of the candidate including mark sheets, degree certificate, experience certificate, etc will be undertaken by the Admission Committee. The selected students shall make payment as per the clause No 8.1/8.2 to secure admission by paying initial fees of Rs. 25,000/- before the deadlines mentioned in their admission letters. All candidates must complete admission formalities as prescribed; failing which admission offered shall stand cancelled without any intimation and the seat will be offered to the waitlisted candidate. The candidates will be informed about the selection results within 10 days of interview, and the final list of candidates admitted in the programme will be displayed on the School website on the commencement of the programme. If at any stage, the information provided by the candidate is found to be false, or non-complaint, then his/her candidature/ admission shall be cancelled and he/she will be disqualified for admission for next two years. All communication by SPM for the Admission Process shall be made through SPM website www.spm.pdpu.ac.in. Candidates are strongly recommended to access the School website on regular basis for admission updates. # The other fee includes reading material expenses, library fee, convocation fee and alumni fee. Lodging and boarding expenses will be charged separately. Outstation candidates can avail hostel accommodation facility of the University. Initial fees of Rs. 25,000/- before the deadlines mentioned in their admission letters. Rs. 1,35,000/- shall be paid at the time of securing admission on or before the registration for the first module. Rs. 1,00,000/- shall be paid before the commencement of the third Module. Rs. 1,00,000/- shall be paid before the commencement of the fifth Module. Fees may be paid in the University Account at Oriental Bank of Commerce (OBC) A/C No. 09331131003242 (current a/c) IFSC code : ORBC0100933 students are required to send fee payment receipt slip of the bank in scan or fax copy before the deadline. The University and its Schools do not accept cash payment. If required, eligible students may avail education loan facility. Oriental Bank of Commerce has agreed to provide study to the students of SPM including PGDPM-X / PGDGM-X participants subject to fulfilment of bank norms. The candidates may however avail Education Loan facility from other banks as per their discretion and convenience also. There is no scholarship scheme for the students of PGDPM-X/ PGDGM-X students. For withdrawal of admission and seeking the refund, a candidate is required to submit withdrawal application along with the fee receipt, admission letter and the letter of refund request duly signed by him/her. If a candidate informs the School about his/her withdrawal of admission in writing on or before the commencement of the first module, the entire payment will be refunded after the deduction of Rs. 2,000/- as processing fee. No refund shall be made if candidate wishes to withdraw admission after the commencement of the first module. The admission of a candidate shall be cancelled if at any point in time it is established that a candidate has been mistakenly admitted. In such an event the fees shall be refunded on pro-rata basis. Ragging is a criminal offence at PDPU and hence no student is supposed to indulge in ragging activities. Anyone found guilty of ragging shall be acted against as per law. In the matter of interpretation of Admission Rules, the decision of the Chairman, Admission Committee shall be final and binding on the candidates. In the matter of such issues as are not covered in the Rules of Admission mentioned above, the Admission Committee is authorized to resolve these special issues on the merit of the case and implement the same for the Academic Years 2017-19. PI for short-listed candidates For all applications received from the admission announcement date (i.e. 15th October, 2017), the PI dates will be decided anytime after 31st January, 2018 onwards as per mutual convenience. The Admission Committee reserves its rights to modify rules without prior intimation, whenever found necessary. Disputes if any with regard to admissions shall be subject to the Ahmedabad jurisdiction only.